Matthew McConaughey is a chameleon, let’s face it, having proved it in films like Magic Mike, Dallas Buyers Club and The Wolf of Wall Street; plus, he plays ‘bad boys’ real good. In Stephen Gaghan’s Gold, he demonstrates it once again. Here he has created a character who’s both charismatic and thoroughly unlikeable and in doing so he’s shown he’s not afraid of going the whole nine yards - to create his role of Kenny Wells, a down-on-his-luck prospector, McConaughey stacked on an extra 20 kilos (from a diet of cheeseburgers, milkshakes and beer! ), lost most of his curly locks and added some unfortunate dental work. When Wells teams up with visionary geologist Michael Costa (Edgar Ramirez) in a last ditch attempt to discover gold, the journey takes him from the desiccated deserts of Nevada to the uncharted jungles of Borneo and the boardrooms of Wall Street. Loosely based on the Bre-X mining scandal of the 1990s, Gold is a rapid-paced, pumped-up adventure that keeps you engaged as it rockets along like a roller-coaster on speed, a bit like the fast-talking Wells himself. It makes for uncomfortable viewing at times and the almost too over-the-top persona projected by McConaughey can detract from the reality of the situation; it verges on the comic at times - scene after scene of McConaughey in his white Y-fronts soaked with sweat and jungle humidity might have some scrambling for the exits! 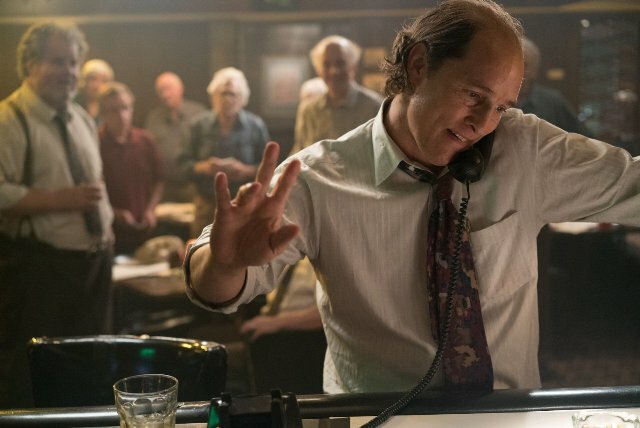 There’s a sense of deja vu too, in that this is another valiant attempt to expose the bitter results of greed and folly but it’s not Gaghan’s best work, nor McConaughey’s. Gold won’t garner any awards but it’s still worth 120 minutes of your time to watch a brilliant actor at work, even if it’s slightly flawed work. Overall, as McConaughey contends, “The story for me is really about what a man like Kenny Wells will do to keep his dreams alive. How far will he go? And he will go all the way.” A bit like McConaughey himself, it seems.